Wisconsin Manufacturers and Commerce. Photo by Riley Vetterkind / Wisconsin Center for Investigative Journalism. The Wisconsin Manufacturers and Commerce – – the same lobby which helped write the State Supreme Court’s ‘no fault recusal rule’ – – sprang into action by pouring money into the Wisconsin Supreme Court race on the ballot Tuesday to aid right-wing candidate Michael Screnock – – by bashing the opponent. Last week, the state’s largest business lobbying group, Wisconsin Manufacturers and Commerce, launched a new television ad criticizing [Judge Rebecca] Dallet for sentencing a man to two years in prison in 2011 for attempted sexual assault of an 8-year-old girl when the maximum sentence was 20 years in prison. 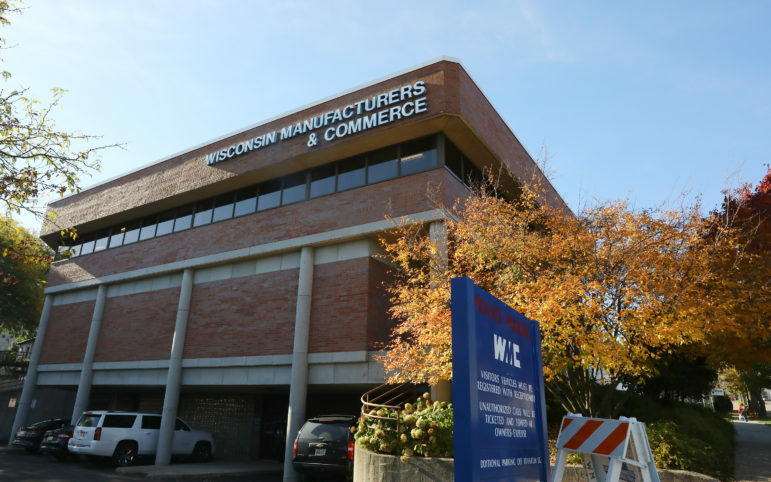 WMC sprang into action to defend the Wisconsin business community from the high court’s rulings. WMC worked with lawmakers to pass bills to overturn the court’s rulings, including restoring caps on malpractice awards, limits on punitive damages and setting aside the guilty until innocent lead paint ruling. WMC ran an award-winning media and grassroots campaign to promote the legislation, and urge Gov. Doyle to sign the bills. But, Doyle sided with personal injury lawyers and vetoed the legislation. So, WMC set out to make sure this dark episode in our judicial history was not repeated. In 2008, WMC spent $2.25 million on issue ads about Justice Louis Butler and his opponent Judge Michael Gableman of Burnett County. One WMC ad — Loopholes — featured Justice Butler’s rulings that provided loopholes to protect criminal defendants. Butler had issued a news release embracing his nickname “Loophole Louie” and that became the centerpiece of the ad. Gableman won, and established a new conservative majority on the high court. The 4-3 majority has served to preserve new laws passed by the Legislature, such as Act 10, collective bargaining reforms passed by the Legislature and signed by Governor Walker. The court has also deferred to the Legislature on many issues, refusing to serve as a policymaking court. In 2011, conservative Justice David Prosser was challenged by liberal lawyer JoAnne Kloppenburg. Unions and trial lawyers spent millions of dollars trying to defeat Prosser to re- establish an activist high court majority, largely in the hopes of overturning the collective bargaining reforms. WMC spent $2 million on issue ads to fight back against the unions and trial lawyers to explain Prosser’s record. Prosser narrowly won the election, and thwarted that drive. WMC worked to pass historic lawsuit reforms that overturned the 2005 Supreme Court rulings — re-establishing limits on medical malpractice awards, punitive damage awards and repealing the lead paint ruling. WMC is the problem. They need to be removed from power.